LSC Half Marathon Race Recap and some EXCITING NEWS about Our Growing Family! 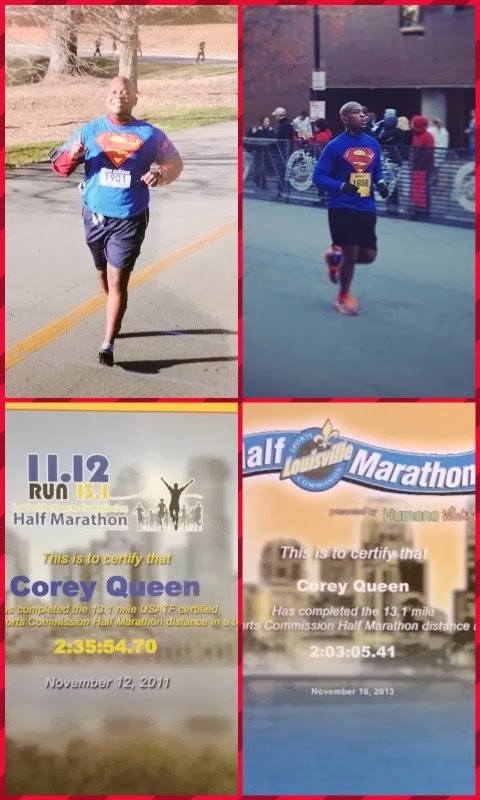 I am sorry it has taken me so long to get this video recap of my last race, the Louisville Sports Commission Half Marathon I ran on 11/10/2013, which wrapped up my 3 races in 3 1/2 weeks (my 3rd Full Marathon on 10/20; 3rd Half Marathon on 10/26; and then this race on 11/10). I also talk about some VERY exciting news regarding our expanding family! Enjoy and THANK YOU for staying around. 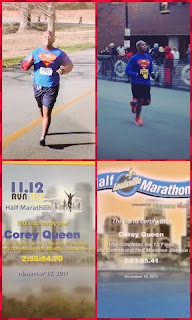 Here is a comparison of when I ran this race two years ago, both weight and time, and when I ran it this year. So I can truly say that this set of races I set out to do months ago has left me feeling better about myself in general. I did this because I wanted to push myself with the training, and to see how my body would handle the grind as well as the "get up" of each race, with my new set of goals. These are my first races since losing the weight. I can see I feel great, and I am already thinking about next year and how I can step up my fitness game. For those that ask me why I push myself on this, it is simple: I REFUSE to live each year, each day, wishing I had done more, or regretting I didn't do more. I have a responsibility with my actions, to be a role model for my children, to make my wife proud that she is married to me. Much Love. so i finally had a free minute to catch up on this post!!!!!! congrats on so many levels!!!!!! AND congrats on a season of races post weight loss!!!!!! you just set a bench mark for yourself,and with each passing race,or season,or goal,you will reach and exceed your expectations,and will have some good learning moments along the way!!!!!!!!! i thought about you before my race today-i wore my superman shirt!!!! i felt the need to harness the superheros! looking forward to hearing what you have in store for 2014!